The Front Desk's at Wittenborg support students and staff in a number of ways and fulfill a combination of roles that are specific to an international environment such as Wittenborg. Each Wittenborg location has a front desk service, although at the main campus in Apeldoorn there are two - one in each building - Spoorstraat and Laan van Mensenrechten. Primarily the front desks combine first line information provision to students and staff as well as a central reception role for the institute as a whole - call Wittenborg, and a front desk team member will take your call!. (+31 886672688) The front desk team are more than happy to assist both students and staff with any non-educational questions regarding Wittenborg, and are also involved with arranging events and social activities throughout the year. 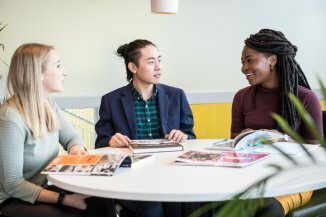 Because Wittenborg is such an international institute, the front desk also provides some of the information provision and administration of an 'international office' aiming to ensure a rich and warm experience for the many international students and staff. The Front Desk team is available Mondays to Fridays at the opening times listed in the buildings, and in the Education Guides (and below). The team provide information and guidance to international students and staff about living in the Netherlands in general, also helping with information and making appointments with local and national offices for housing, immigration, healthcare and socialcare if needed. "We are here to help our international students from abroad get settled in the Netherlands on arrival, by assisting with their registration appointments as necessary offices, such as the Immigration Department (IND) and the City Hall (Gemeente). We can also arrange medical appointments with doctors and dentists, and assist with all relevant insurance documentation." "In choosing Wittenborg, many of you will also have chosen to live in another country; Front Desk can help you find your way in your new study environment with all sorts of information ranging from public transport, ICT issues, registration questions, work options, to even where to buy a bicycle."